Dropbox's Terms of Service will be changing effective May 25, 2018. Click here to review the new terms. When	When you use our Services, you provide us with things like your files, content, messages, contactscontacts, and so on ("YOUR STUFF"). Your Stuff is yours. These Terms don't give us any rights to Your Stuff except for the limited rights that enable us to offer the Services. We	We need your permission to do things like hosting Your Stuff, backing it up, and sharing it when you ask us to. Our Services also provide you with features like photo thumbnails, document previews, commenting, easy sorting, editing, sharingsharing, and searching. These and other features may require our systems to access, storestore, and scan Your Stuff. You give us permission to do those things, and this permission extends to our affiliates and trusted third parties we work with. You're	You're responsible for your conduct. Your Stuff and you must comply with our Acceptable Use Policy. 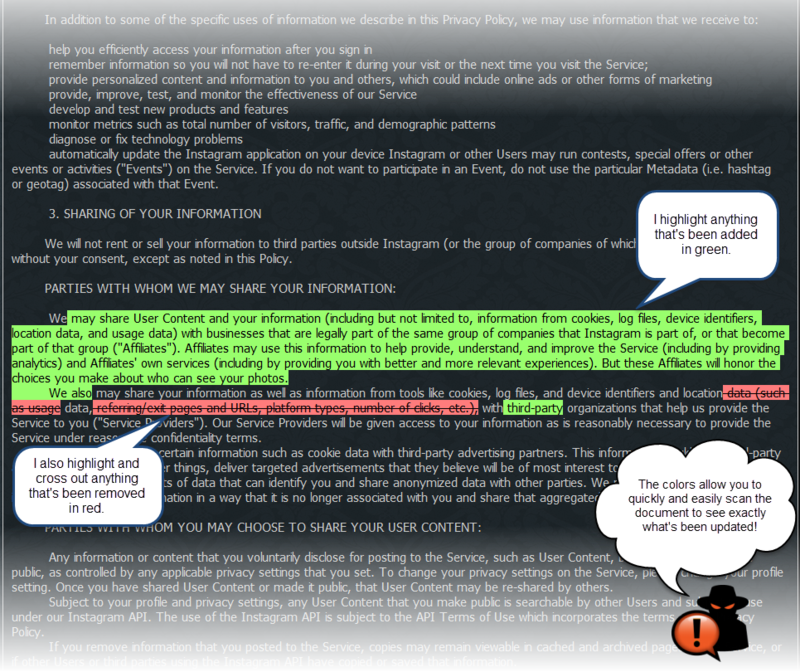 Content in the Services may be protected by others' intellectual property rights. Please don't copy, upload, downloaddownload, or share content unless you have the right to do so. You	You may use our Services only as permitted by applicable law, including export control laws and regulations. Finally, to use our Services are not intended for and may notServices, you must be used by people underat least 13, or in some cases, even older. If you live in France, Germany, or the Netherlands, you must be at least 16. Please check your local law for the age of 13. By using our Services,digital consent. If you are representing to us that you're over 13.  don’t meet these age requirements, you may not use the Services. The	The Services are protected by copyright, trademark, and other US and foreign laws. These Terms don't grant you any right, titletitle, or interest in the Services, others' content in the Services, Dropbox trademarks, logos and other brand features. We welcome feedback, but note that we may use comments or suggestions without any obligation to you. No	No Refunds. You may cancel your Dropbox Paid Account at any time. Refunds are only issued if required by law. For example, users living in the European Union have the right to cancel their Paid Account subscriptions within 14 days of signing up for, upgrading toto, or renewing a Paid Account. Email	Email address. If you sign up for a Dropbox account with an email address provisioned by your organization, your organization may be able to block your use of Dropbox until you transition to an account on a Dropbox team (e.g., Dropbox Business plans or Dropbox Education)Education plans) or you associate your Dropbox account with a personal email address. We	We strive to provide great Services, but there are certain things that we can't guarantee. TO THE FULLEST EXTENT PERMITTED BY LAW, DROPBOX AND ITS AFFILIATES, SUPPLIERS AND DISTRIBUTORS MAKE NO WARRANTIES, EITHER EXPRESS OR IMPLIED, ABOUT THE SERVICES. THE SERVICES ARE PROVIDED "AS IS." WE ALSO DISCLAIM ANY WARRANTIES OF MERCHANTABILITY, FITNESS FOR A PARTICULAR PURPOSEPURPOSE, AND NON-INFRINGEMENT. Some places don't allow the disclaimers in this paragraph, so they may not apply to you. WE	WE DON'T EXCLUDE OR LIMIT OUR LIABILITY TO YOU WHERE IT WOULD BE ILLEGAL TO DO SO—THISSO--THIS INCLUDES ANY LIABILITY FOR DROPBOX'S OR ITS AFFILIATES' FRAUD OR FRAUDULENT MISREPRESENTATION IN PROVIDING THE SERVICES. IN COUNTRIES WHERE THE FOLLOWING TYPES OF EXCLUSIONS AREN'T ALLOWED, WE'RE RESPONSIBLE TO YOU ONLY FOR LOSSES AND DAMAGES THAT ARE A REASONABLY FORESEEABLE RESULT OF OUR FAILURE TO USE REASONABLE CARE AND SKILL OR OUR BREACH OF OUR CONTRACT WITH YOU. THIS PARAGRAPH DOESN'T AFFECT CONSUMER RIGHTS THAT CAN'T BE WAIVED OR LIMITED BY ANY CONTRACT OR AGREEMENT. IF	IF YOU USE THE SERVICES FOR ANY COMMERCIAL, BUSINESSBUSINESS, OR RE-SALE PURPOSE, DROPBOX, ITS AFFILIATES, SUPPLIERS OR DISTRIBUTORS WILL HAVE NO LIABILITY TO YOU FOR ANY LOSS OF PROFIT, LOSS OF BUSINESS, BUSINESS INTERRUPTION, OR LOSS OF BUSINESS OPPORTUNITY. DROPBOX AND ITS AFFILIATES AREN'T RESPONSIBLE FOR THE CONDUCT, WHETHER ONLINE OR OFFLINE, OF ANY USER OF THE SERVICES.